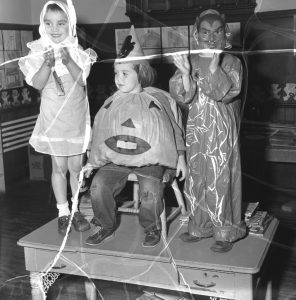 1953 Christopher Unger, age 5; Mary Russie, age 3; Steven Abbott, age 5 on a desk at school. 74169	TL 1 Nov 1953 : Christopher Unger, age 5; Mary Russie, age 3; Steven Abbott, age 5. Halloween.